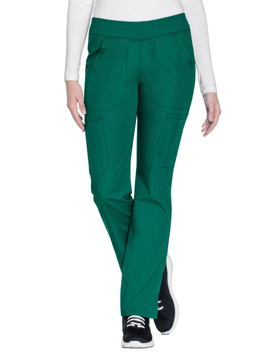 A contemporary fit, mid rise, tapered leg, pull-on pant features an all-around elastic waistband, front slash pockets and cargo pockets (the right with a pen slot, the left with an inside Dickies logo twill-tape instrument loop). Also featured are , and double needle topstitching throughout. Also featured are a scissor pocket, Dickies logo charm, side vents, and double- and triple-needle topstitching. Regular inseam: 30½”. Petite inseam: 28". Tall inseam: 33½".